In County Donegal today, there appears little evidence that its cities and towns were once connected by rail lines. However in the early part of the 20th century, County Donegal Railways was the quickest and easiest way for passengers to get around the county. When rail service was provided, what had once taken days to travel by horse and cart took only hours by train. Travel by rail in Ireland started in 1834 when a line was built between Dublin and the port of Dun Laoghhaire (then known as Kingstown). In no time new rail lines connected cities throughout Ireland. Shortly after the Great Famine, a rail line was planned along the River Finn between Strabane in County Tyrone and Stranorlar in County Donegal. This, the first line in County Donegal, opened in 1863. The Finn Valley Railway made stops at stations in Clady, Castlefin, Liscooly, and Killygordon. The next step was to build a branch from Stranorlar to Donegal Town through the Barnesmore Pass. This was completed in 1882 by the West Donegal Railway, although the company had financial difficulties that required them to stop short of the town by 4 miles. Passengers had to get to Donegal Town by horse-drawn cars at an additional cost of sixpence. The extension to town wasn’t completed until 1889. The Finn Valley Railway and West Donegal Railway merged in 1892 to become the County Donegal Railway Company. 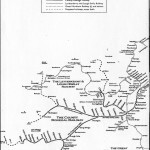 Rail lines from Donegal Town to Killybegs and Ballyshannon were added in 1893 and 1909 respectively. Meanwhile, the line from Stranorlar to Glenties was opened in 1893. At that time, to match the rest of the country, the rail system switched from standard to narrow gauge and changes had to be made at railway stations constructed earlier as well as to the original rail line from Strabane to Stranorlar. A branch was constructed from Strabane to Letterkenny in 1909. 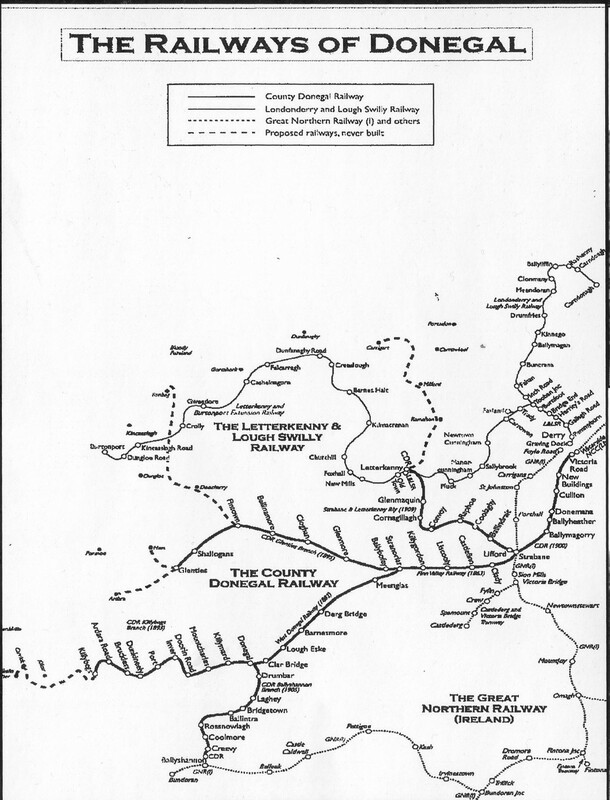 Another line from Letterkenny was extended to Burtonport, and another was extended from Letterkenny to Carndonagh in Inishowen with a spur off to Derry City. After years of steam locomotives, County Donegal Railways became pioneers in using diesel-powered locomotives in the 1930s. However, the automobile was providing more and more personal travel during those years, and the days of train travel in Donegal were numbered. The lines of County Donegal Railways started shutting down in 1949. By 1960, all of its lines were closed. The last train from Stranorlar pulled into Strabane in December, 1959. Please click on the railmap above to get a larger image of the map. If you click again, it will enlarge further making it easier to read.